We offer a comprehensive range of Plastic Handles, fabricated from finest quality plastics. 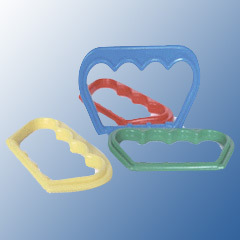 Our plastic handles are available in different seizes and grades. Acknowledged world over for its design and high tensile strength, these handles are available in different varieties like Handle for Tin Containers, 100 mm Plastic Handle, 90 mm Plastic Handle, 65 mm Plastic Handle and Edible Oil Bottle Handle. These handles are a fine combination for performance and innovative design. These handles are suitable for 5 ltr. to 20 ltr.metal/tin cans.These will give comfort for lifting tins while transporting or at the time of using. These will give asthetic look to tins with same colour of spout caps for any edible oil or ghee packing. These can be spot welded on tin tops and become integral part of it. athey are also available in various colours.